A woman who dialled 999 threatening to harm herself quickly turned violent when police arrived and punched an officer in the face. Carolanne Achilles (57) claimed the call she made had been nothing more than “a throwaway remark” before landing her blow. 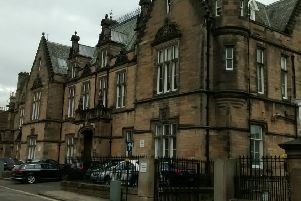 She appeared at Falkirk Sheriff Court last Thursday, having admitted assaulting PC Darren Stewart to his injury at an address in Kilbirnie Terrace, Denny on June 15. Upon arrival, police noted Achilles as being in an agitated state and thought she had been drinking. Procurator fiscal depute Graham McLachlan: “She said she wasn’t drunk and told them the 999 call was a throwaway remark and she was a bit down due to her dad’s passing. “Ambulance staff attended and advised she go to the hospital as she was showing signs of low blood pressure. That made the accused angry and she refused to go. Her defence solicitor told Sheriff Derek Livingston that Achilles is a recovering alcoholic who is trying to tackle her issues by herself. Achilles, of Kilbirnie Terrace, Denny, was warned she narrowly avoided imprisonment, as she already has two convictions involving police. She was fined £200, to be paid within 28 days, and ordered to pay £200 in compensation.